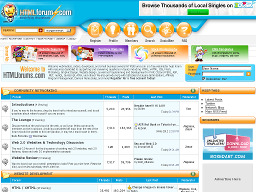 Cre8asiteForums.com A highly rated discussion forum website focusing on website building, ecommerce, search engines and search engine optimization. Worth a look if you're looking for information in one of these areas. 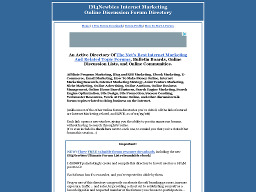 IM4Newbies Internet Marketing Online Discussion Forum Directory A directory of LIVE Internet marketing and related topic forums, bulletin boards, online discussion lists, and online communities. Each link opens a new window, giving you the ability to post in numerous forums, without having to search through favorites. 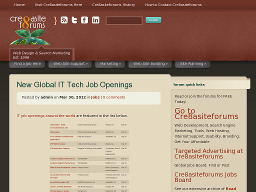 HtmlForums.com An excellent site to visit if you have questions regarding website development or promotion. The forum has over 12,000 members and 37,000 message threads. Some good stuff on tools and scripts as well. WebmasterWorld.com One of the most trafficked sites on the Web and the big kahuna of discussion forums. If you're a web professional looking for the latest news and discussion on webmaster topics, this is the place to visit. SiteOwnersForums.com A forum discussion site where Web professionals exchange ideas about site design, development and e-business. One of the Web's key resource sites for tools, articles, and do-it-yourself tutorials. The Webmaster Forums One of the largest webmaster communities on the Net with close to 100,000 message posts and over 6,900 members. A good site for webmasters to share knowledge and problems. HelpWithWindows.com A useful Windows tips and news site. Covers the Windows 95/ 98/ ME/ 2000 and XP operating systems. The site also has a busy support discussion forum that provides additional help. 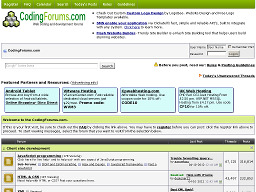 CodingForums.com A discussion board dedicated to web coding and development. Topics covered include, asp, perl, html, css, xml, mySQL, graphics and more. 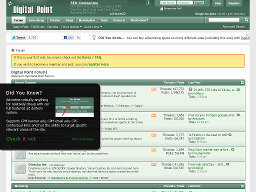 Digital Point Forums One of the most active and popular webmaster discussion forums on the Web. A great deal of useful information can be found here. 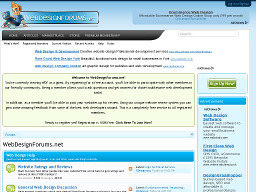 WebDesignForums.net A discussion forums site devoted to web development and programming. 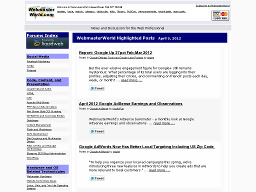 A good place for webmasters to meet and swap ideas. The site currently has over 4,200 members and more than 9,400 threads and 90,700 posts. DesignersTalk.com A popular forum site with discussions that focus on web design and development. The site currently boasts over 414,000 message posts and 44,800+ members. 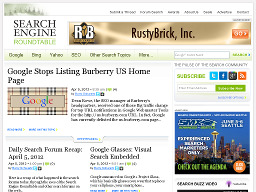 SERoundTable.com Reports on the most interesting threads at various Search Engine Marketing forums, providing a synopsis that provides greater detail on those threads. Techguy.org One of the top tech support forums on the Web, covering a broad range of support topics, including computer hardware, software, security, networking, web design, email, etc.